Here I am sitting in our TLF (temporary living facility) while hubs is off doing stuff with his new squadron. Upon checking my email I see I've gotten an email from one of my favorite clients, B. Before the insanity of the holiday season started I finished up an invitation design suite for her. You may recall her save-the-date postcards from earlier in 2009. Well, today she sent pictures of the final printed and assembled invitation! They look FANTASTIC so I just have to share. 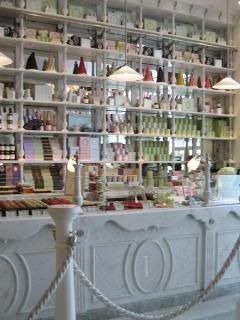 "French tea salon ... lovely chandeliers, wood panels, warm and cozy light, beautiful pastries, macaroons and other yummy things lined up on the shelves and counters, tea and hot chocolate served in wonderfully detailed tea cups." 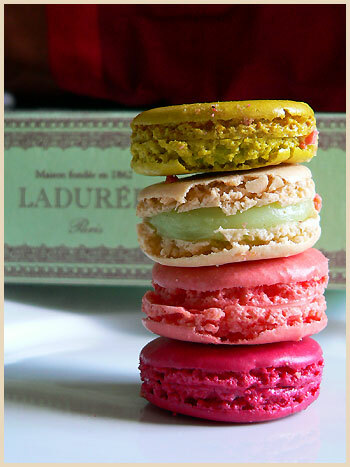 She added that Ladurée's (of Paris macaroon fame) packaging embodied exactly the kind of look she wanted to go for. Umm, how perfect is that for a spring-time French château wedding? I was psyched to get started on designs! After a bunch of concepts and revisions this became the final design. B used Catprint.com and had them print everything on their 107lb shimmer cardstock. The paper punch she found in Hong Kong on a trip. The pocketfolders and envelopes are from paperandmore.com.